A car of the brand-new MRT was spray-painted in Lebak Bulus Depot in South Jakarta on Friday morning, prompting demands to increase security around the depot. 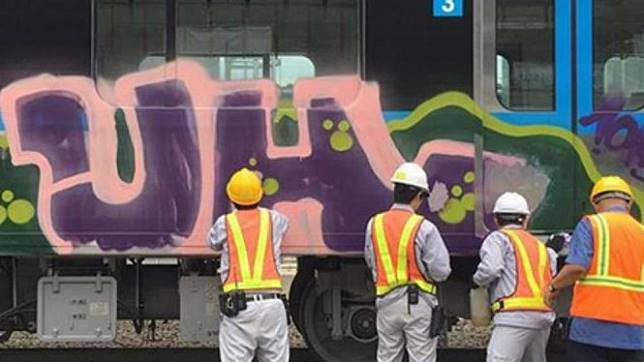 “MRT Jakarta has asked the contractors to remove the graffiti on the train car and increase security in the area,” said MRT Jakarta spokesperson Tubagus Hikmatullah in a press release. The perpetrator had allegedly entered the depot, where the trains were housed and cleaned, by climbing over the walls. MRT Jakarta and the contractors — Japanese companies Metro One Consortium and Sumitomo Corp. — are investigating the case. The trains are still under the responsibility of the contractors because the MRT was still in the testing phase. Tubagus said the company had demanded that the contractors increase the security personnel, increase patrols, add CCTV cameras and increase the height of the walls near the public areas. The police have received reports about the incident and have come to the location for further investigation. “MRT Jakarta is still convinced that this incident will not disturb the plans to finish the project by March next year,” Tubagus said.